The letter banners portion can be changed as often as required, Free of Charge ! This type of sky sign is perfect for the venue which changes its theme regularly. The logo billboard section guarantees your attraction is instantly recognized therefore reinforcing your advertising campaigns effectiveness with a hugely recognizable sky display. The first time Airborne Corporate Logos were seen in Australia was when SKY-ADS flew the World Expo 88 logo. 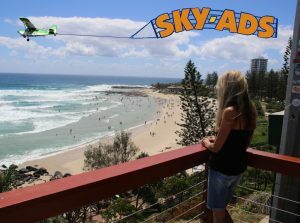 SKY-ADS Logo Banners flew each week overhead World Expo 1988 in Brisbane. World Expo 88 had a different theme each week. So our Banner was changed each week to announce the Expo Theme for that week. Having never seen this type of sky display before in Australia, we therefore created huge interest with our new type of sky sign. 1.5 meter high Corporate Logos can be added anywhere along a banner. Our Combination Logo Banner for World Expo 1988 had two 1.5 x 1.5 meter logos at the beginning and end of the Banner. As a result, the banner had a pleasing bookend appearance. Corporate sky sign logos placed at the beginning of a banner are 3 meters high and custom in length to suit your artwork requirements. For example the Twin Towns corporate Logo pictured above is 3 meters high and 9 meters long, which is 10 feet high by 30 feet long. Most importantly up to 30 of our famous Letters can be added behind. Corporate Logos placed at the start of an Aerial Display can be up to a massive 20 feet high or 6 meters high. As a result of being towed by an aircraft, we can provide wide screen format aerial artwork. As opposed to helicopters which are limited to a square shape. In other words our Logos can be up to 5 times as wide as they are high. As with all thing aviation, the bigger the logo the fewer letters we will be able to carry behind. Certainly our, cheap to run, little aircraft does an amazing job towing banners and aerial displays (way above what others can) but she does have her limits. Call or email so we can discuss the best compromise for your situation. We have many Aerial Display solutions. For example there is always a Billboard solution. In conclusion, Logo Sky Signs combine the instant recognition of your companies advertising artwork with the ability to change the attached letter banner any time you wish – Free of Charge!!! 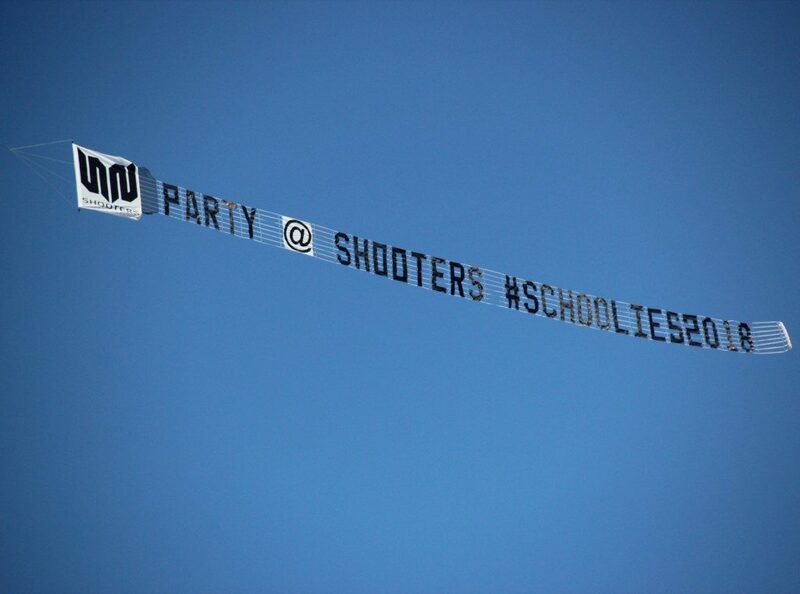 An example of this is the very successful series of Sky signs we perform for Shooters Nightclub in Surfers Paradise. Shooters changes its theme nightly. So SKY-ADS keeps their customers up to speed by changing the message of their sky display every day. Similarly, the Golden Casket range of Loto products have a corporate logo for each of their products. The companies product Logo remains the same but the message changes to reflect this weeks jackpot which is being promoted. Twin Towns Services Club is another successful corporate attraction which makes extensive use of Combination Sky Displays. See more Above.